In this section we'll setup the CUBLOC and Mach3 to operate a rather simple pendant for controlling Mach3. It will have three pushbuttons used for Cycle Start, Feed Hold and Stop, one pot for Feedrate Override and three LED's to indicate various states of Mach3. We've already looked at how to set up the inputs and outputs of the CUBLOC so the only thing left to do there is to setup an analog input for the Feedrate override pot. 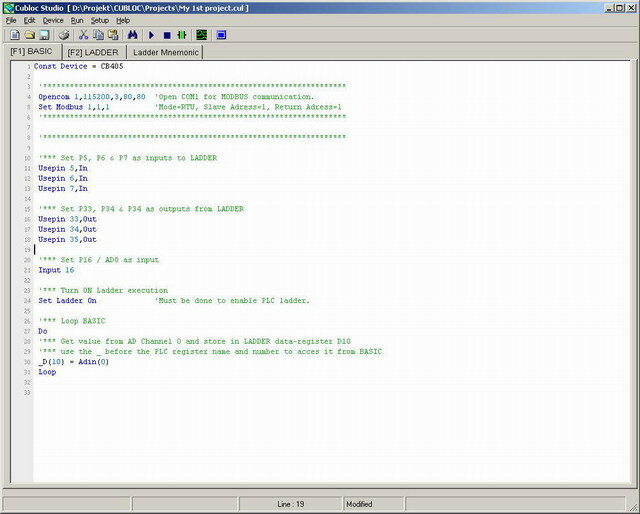 If you remember we used the command Usepin to set the direction of our I/O ports when used for LADDER. To set the direction of an I/O when used in BASIC we use the command Input. In this case I've set P16 as an input. P16 happens to be ADChannel 0 on the CB405 module. Then inside the Do-Loop I've added code to read the analog input and store it's value in the "LADDER memory" at adress D10. The underscore before D10 is used to tell the CUBLOC that it is the LADDER memory we want to access. In Mach3 we need to setup the Modbus Plugin so that it reads and writes the proper registers in the CUBLOC. To do this we select Function Config's/Setup Serial Modbus. As you can see I've setup 3 Modbus Configurations. The three outputs, P33, P34 and P35 will be updated every 200mS, the three inputs, P5, P6 and P7 will be read every 100mS just as the analog value from the pot. As stated in the CUBLOC manual the D-registers starts at adress 28672 ($7000h) so the the D10 register, holding the value of the FRO pot, is at adress 28682. To start the automatic polling it's just a matter of ticking the ModBus Run checkbox.